Get more from the Internet with IDX service. The sooner you sign-up… the more you SAVE! Add a NJMLS Internet Data Exchange (IDX) Smart Frame to your website and offer NJMLS listing information to the public. With a larger inventory of listings, consumers are more likely to return to your website more often! Add a NJMLS IDX SmartFrame to your existing website. Just $10/month (normally $19.95/month) with a $25 set-up fee (normally $50) when you pre-pay through the end of 2010. Get a full-featured website with a IDX Smart Frame, web hosting, domain registration, and email. Just $24.95/month (normally $49.90/month) with $199 setup fee (normally $649) when you pre-pay through the end of 2010. For additional information call 973-303-4300 or email us at sales@readvantage.com. Member of another MLS and need an IDX solution, just give us a call or contact us to see if we have a solution for your area. * Offers apply to new IDX Smart Frame Agreement and Promotional Rider signed between 5/1/10 and 12/31/10. Only available to new IDX Smart Frame customers or accounts that have been inactive for 12-months or more and does not include additional website addresses (URL). RE/Advantage specializes in Real Estate Website Design, IDX Solutions, and Internet Technology. We have been working with the Real Estate Industry for over 10 years so we understand what makes a site work for you and your buyers and sellers. 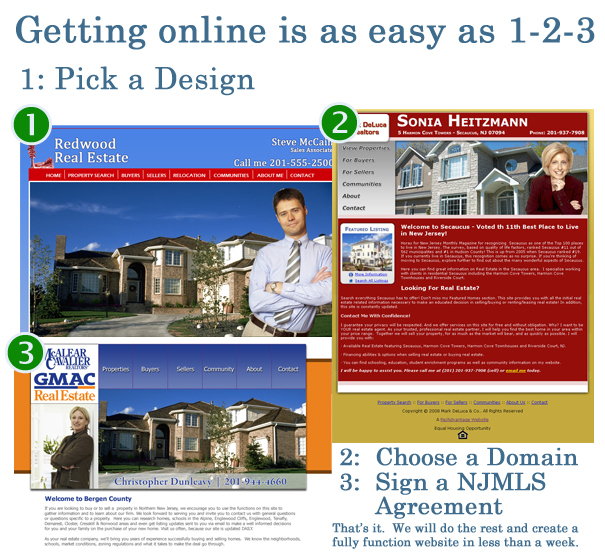 After all we have been developing real estate web sites, Internet tools and marketing strategies since 1997. No one provides a more comprehensive, well-thought-out site and tool set for your Internet presence. We provide you with not only the tools to manage and customize your site, but the peace of mind that comes from knowing we are here to help if you need us.